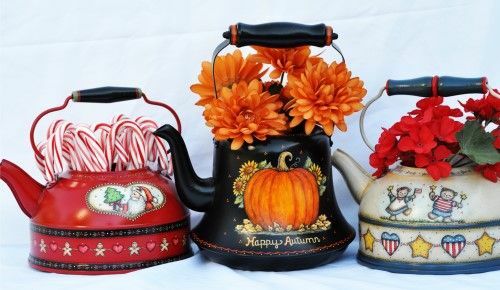 Featuring three teapots, one for Christmas, one for autumn and one that is patriotic. There are also different designs on the backs of the teapots. These were old teapots that I found at garage sales or flea markets but the designs could be adapted to fit other teapots, buckets or other surfaces. This e-packet contains: Complete directions, 10 color photos and three full size pattern pages for a total of 12 pages. You will be able to download this e-packet immediately after payment. When you click on the "Return to Barbara Nielsen Designs" button in PayPal you will be returned to the website where you will see the order acknowledgement page containing the downloadable file. No shipping charges apply. When you download the PDF file be sure and save it on your computer!